GSoC Update: What’s Interesting… in KStars? This is really very late. I had been very busy trying to get my visa for Akademy which I ultimately failed in. Anyway, Akademy is over now and things are looking fine with my GSoC endeavour. I am mostly done with beginner-level implementation for the What’s Interesting… feature. 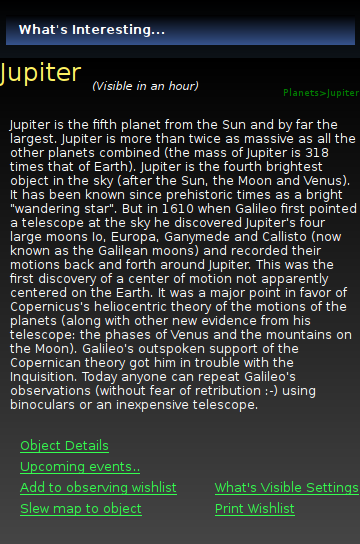 My feature now suggests Planets, Bright Stars and Constellations to the user. 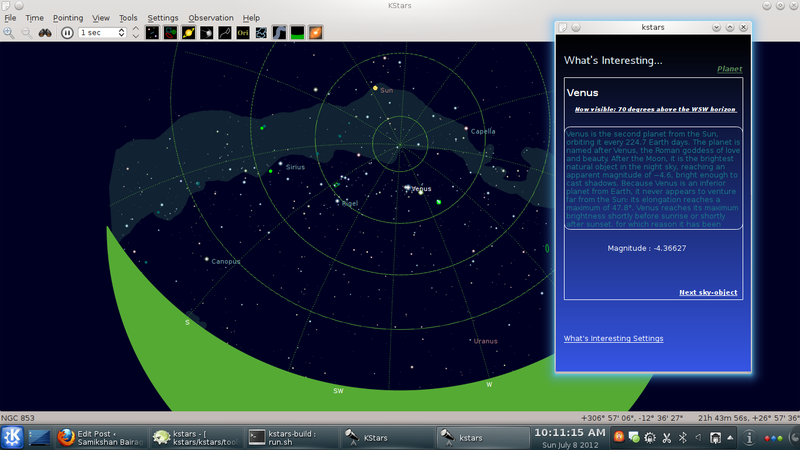 The user can click on a sky-object from the list suggested and the skymap slews to centre the sky-object on the map. The details for the sky-object is shown along with its approximate position in the sky-map. The user can view the next “interesting” object from this details-view as well. Deep-sky objects are available but are unfiltered(all are not interesting to look at). So I have used a QML interface for this feature. Getting to learn the model-view stuff and actually implementing it was exciting. I miss the thrill now a bit. 😉 Anyway, back to brief technicality, the models for the QML ListViews are defined in C++ classes by using QStringList based models for the category selection views and by sub-classing QAbstractListModel (class SkyObjListModel ) for the list of interesting sky-objects belonging to a particular category. Sky objects are stored as SkyObjItems. The SkyObjItem class subclasses QObject and its instances are used as items in the SkyObjListModel. I later plan to write another blog on how I used the C++ list model in QML and how the different signals from the QML interface were implemented in C++ slots. Bortle Dark-Sky Scale will be used to calculate the LM and subsequently the SB_0T. This will be used to calculate the TLM. It has almost been a year since Season of KDE, 2011 happened and now its time for Google Summer of Code, 2012. The students’ application period is over now, and this would be a good time to blog about my proposal and thoughts. 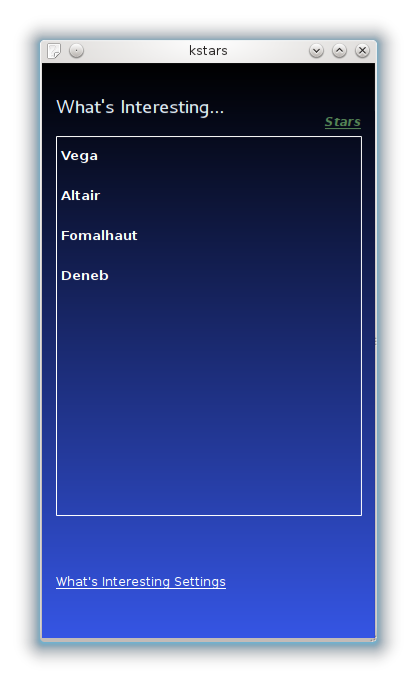 Choosing to work on KStars and KDE during the summer, if I do get selected, was also not a difficult choice to make. Being connected with KStars for over 10 months now, I had to contribute to KStars something that I could actually relate to. Being a beginner in astronomy, the idea of making KStars more beginner friendly had always been very attractive to me. I was therefore certain that this was what I actually wanted to work on during the summer. I plan to work on two features during the summer coding period. One would be adding a new feature named “What’s Interesting…”. The other feature I would work on is “Star Hopping” in KStars. In the next few sections I will talk about both in slight detail. This feature will basically be a QML based user interface that will suggest sky objects which are currently visible and interesting. Interesting refers to the interest of the user. Intermediate users for example would probably not need suggestions on planets and their positions. The sky object should be visible in the current sky +/- 1 hour. Taking into account the location conditions and availability of equipment of the user, the sky objects should not be too difficult to see. There is already a feature known as “What’s Up Tonight”, which is not of much help at present. This is because the results or suggestions are not personalised. The user should not be suggested to have a look at the Andromeda Galaxy when the location is a city badly polluted with light. 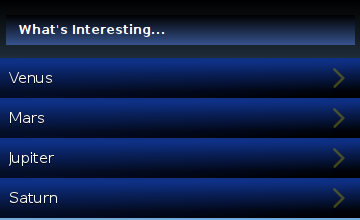 So “What’s Interesting…” aims to provide more helpful suggestions in a much more attractive manner through a QML based GUI. Every time “What’s Interesting…” is started by the user, a easy-to-use wizard would open up asking the user for information like his location, location conditions, interests, equipment in possession and specifications. An option to skip all these steps would be provided in case the user wants to use previously stated conditions. One option not provided in the mockup here for the details view window, is the “Get directions to here”. 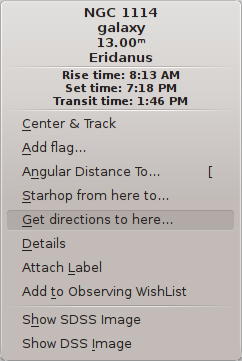 This option would be there in the details view for deep-sky objects. This would provide the user star hopping directions to the current deep-sky object. These star hopping directions would also be ‘personalised’ by taking into account equipment availability and location conditions of the user. Location conditions of the user here refers to the amount of light pollution in the area. How to take this into account? For this Bortle Dark-Sky Scale will be used. It is a nine-level numeric scale that measures the naked-eye and stellar limiting magnitude for a particular location. A chart as in here helps to get a better idea. The user will be asked to rate his own sky from 1 to 9 after being provided with such a chart. The limiting magnitude associated with each rating would then.be used as a parameter to screen out deep-sky objects of greater magnitudes (Confusion alert: In astronomy Greater magnitude == Lesser brightness). Also equipment available to the user will play a role in screening out more sky objects. Specifications of available equipment would be converted into scores for respective equipment such as “Telescope Score” and “Binoculars Score”. Deep-sky objects which require greater scores would be screened out. These implementation details are provided in my proposal in much greater detail. Replace hard-coded values of limiting magnitude(maglim) and equipment field-of-view(fov) parameters in StarHopper::computePath() for real values. Dialog to initiate star hopping that asks user for location conditions (rate the light-pollution in the area according to the Bortle Dark Sky Scale), equipment specifications and the destination star. Destination star is to be either selected from a list or selected manually from the skymap. 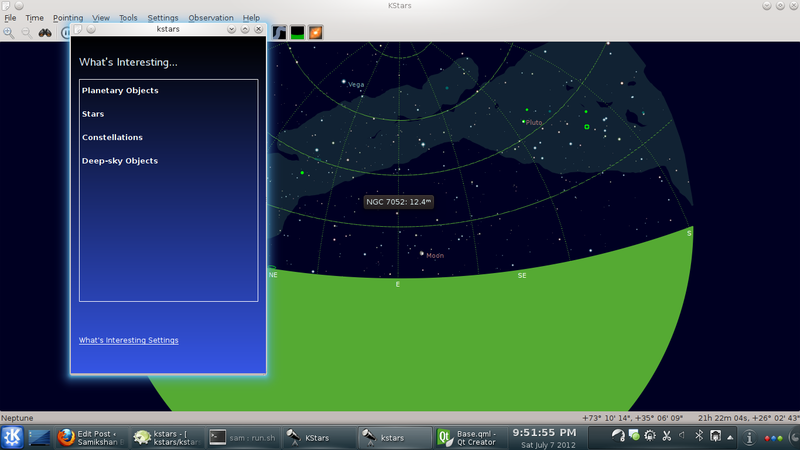 Users can currently use “Starhop from here to…” in the popup menu that opens up on right-clicking on the skymap. Now, a new option”Get directions to here…”, enabling users to get star hopping directions to a destination star, to be added in the popup menu. 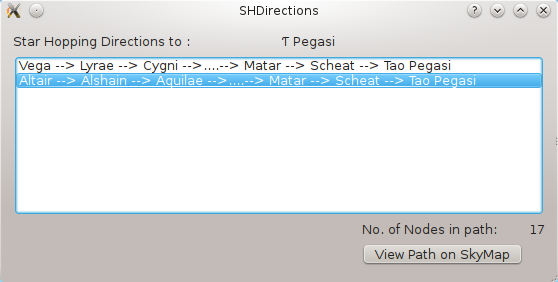 Dialog that displays list of star hopping directions to a destination star. So that was the summary of what I plan to be doing this summer. For a more technical and detailed read, my proposal is available for public viewing at http://www.google-melange.com/gsoc/proposal/review/google/gsoc2012/samxan/1. Hope April 23rd turns out to a happy day! Will keep my spirits high and prepare for college examinations till then.